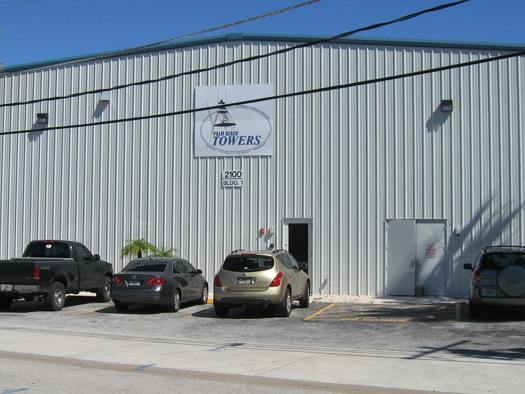 Palm Beach Towers New State-of-Art 10,000 square foot manufacturing facility is headquartered at 2100 Avenue B, Building #1, in Riviera Beach, FL. Our satellite location, Palm Beach Towers North, is headquartered at the Viking Yacht Company Plant in New Gretna, NJ. Both locations have full-time experienced welders, fabricators, carpenters, installers, fiberglass repair and mechanical technicians that provide the industries best service possible, guaranteed. Directions to Palm Beach Towers from Palm Beach International Airport. • Go east on Blue Heron Blvd past railroad tracks to US1 (Federal Hwy or Broadway). Turn Right. • Right before first light, take left on E 21 st St.
• Then drive straight east up to your 2 nd stop sign. At the stop sign PBT building will be on the southeast corner. • Park in front of the PBT building. Directions to Palm Beach Towers from Ft. Lauderdale International Airport. Directions to Palm Beach Towers from ICW/Lake Worth Inlet (also known as Palm Beach Inlet). • When coming thru the Lake Worth Inlet, follow the ICW (Inner Coastal Waterway) around the south side of Peanut Island, then bear north up the ICW. • You will continue north through the ICW until you get to Marker Red 40, we are directly west of Marker Red 40.